Ten years ago, my friend Dave and I were sitting in class together at Moody Bible Institute learning things like how to exegete a passage and preach it well. 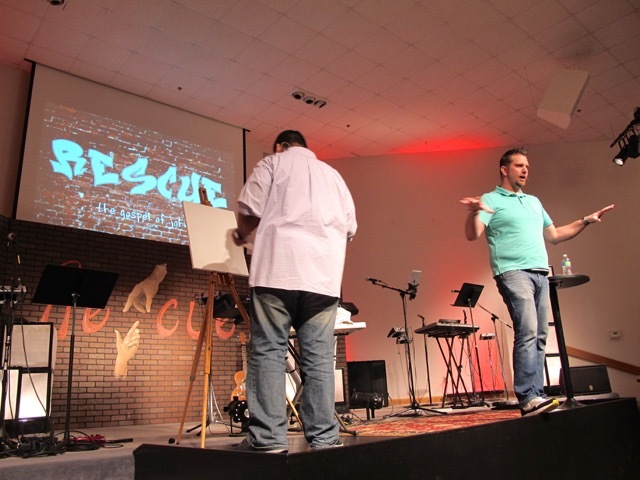 This past Sunday we both put our training to use by preaching side by side with one big difference. He used his voice and I used my paintbrush. Beginning the 1st service with a blank canvas. 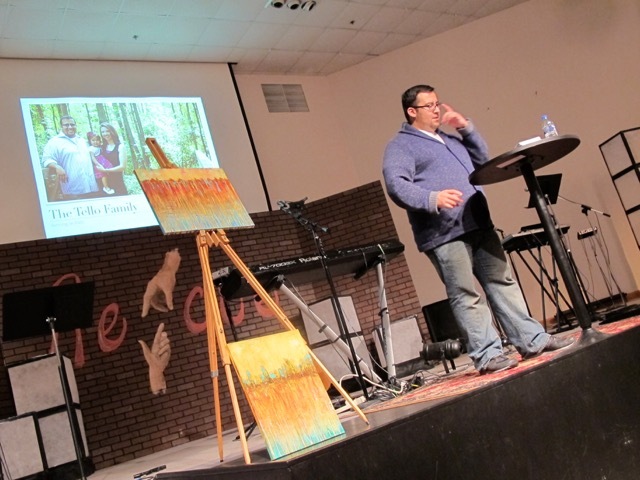 During the 2nd service I used a new blank canvas and felt prompted to turn it the other direction. 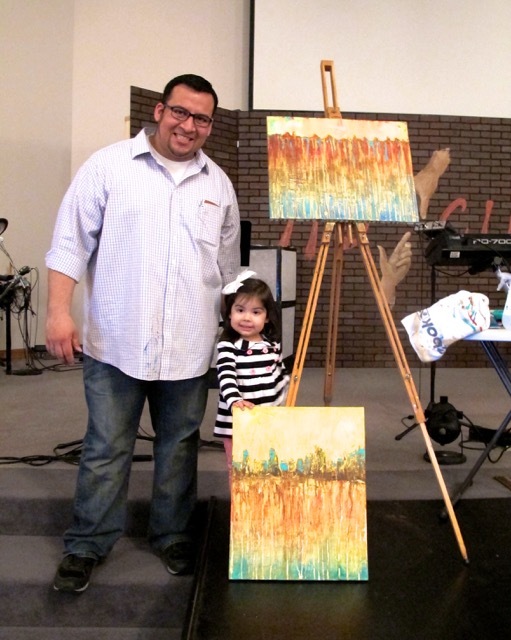 Dave is the Pastor at New Horizons Community Church and he invited me to paint live while he preached to the congregation during both services. As Dave was preparing in the days prior to preaching the message, so did I. I studied the passage as if I was going to preach the message (in the traditional sense) myself. When we got up in front for the service that morning our methods were different but our aim was the same: to present the truth of the passage to the people. Dave did so in words while I used texture and color. Unlike if I had preached in words, I didn’t have an outline prepared. I do not do any sketches ahead of time or other prep for painting. I leave things open because I want the Holy Spirit to work through me. It keeps me humble because I need to totally depend on him for direction. I’ve done this before. While in Italy I stepped way out of my comfort zone for the first time when I did live painting at an evangelistic outreach. It wasn’t how I liked to create art because I had no control. But God showed up and I realized the power of letting Him lead as I saw what he helped me create and how it affected others. Since then I’ve done more live painting and become more accustomed to pushing through that nervousness of not knowing what will end up on the canvas and riding the anticipation of what it will be. 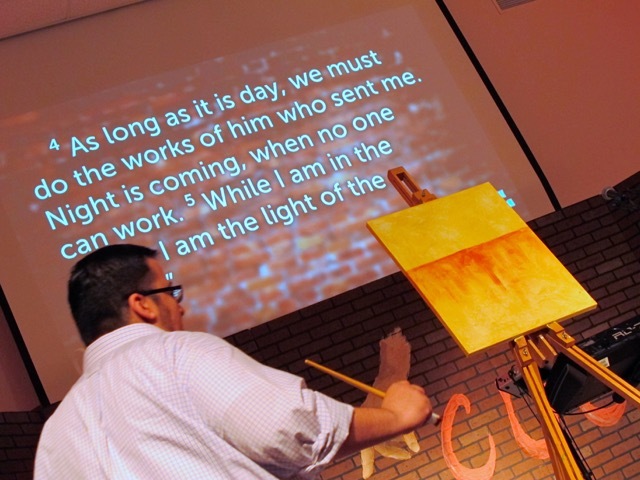 This time was unique though because it was the first time I had the opportunity to paint live in an American church setting. 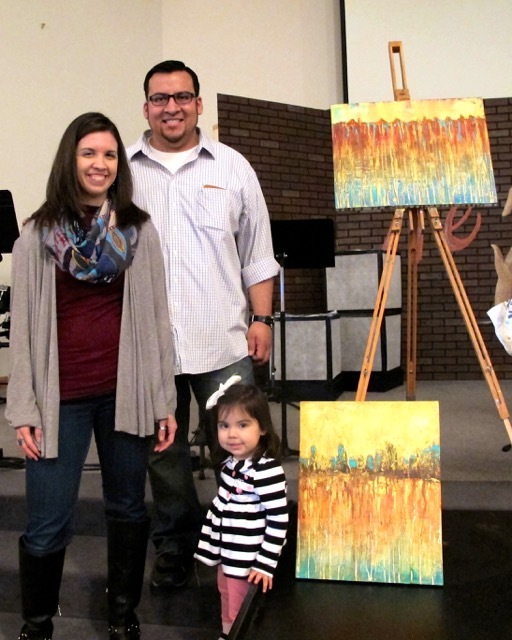 Create a painting in front of a room full of people in 30 minutes that has spiritual significance? No pressure (insert sarcasm)! 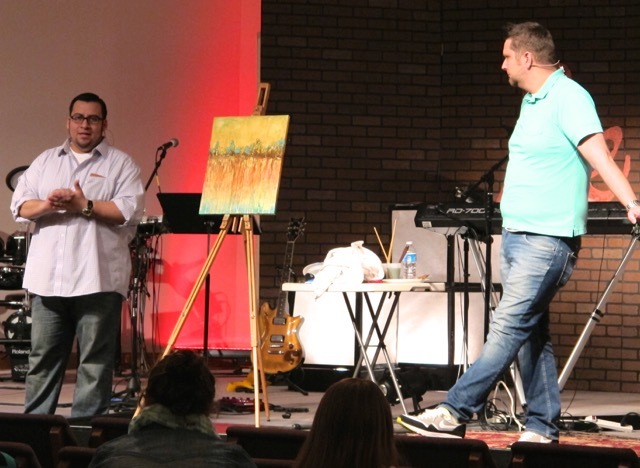 Explaining to the congregation about the painting that the Spirit helped me produce and what significant elements can be seen in it. I never know what things are going to look like and am amazed at what comes out. I never know how exactly God is going to use it exactly, but that is ok. I know God has called me to create art and that is what I do. Once I am done creating it, I give it back to Him and it’s up to Him to take it from there. I am so privileged to be able to serve God in this capacity. Whether He reveals its purpose to me or not, I know He is the Master designer and I can leave it in His hands. Family photo with the finished products after both services. The one Arianna is holding is from the 1st service. The top one is from the 2nd service. Same message, different audience, slightly different creation. If you would like to see the service for yourself, you can view a video here. You can watch it all the way through to see how the verbal and visual message connect and provide a multi-dimensional experience with Scripture. If you just have a few minutes, skip to the end where Dave interviews me about the finished piece! I also had the chance to show a series of paintings, “The Hope of Glory,“ during an evening event New Horizons where we were able to share more about our ministry. 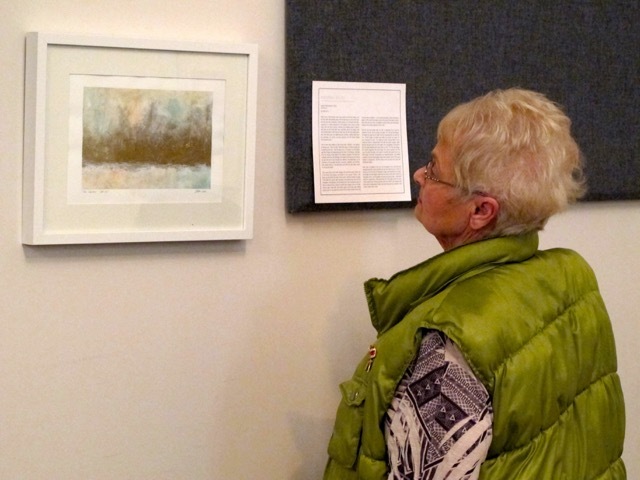 What a privilege to give them a first hand experience of two types of art ministry in one day. I had so much fun talking to different artists in the church and I am always so encouraged by them. I am continually impressed by the unique drive God gives to artists. The artists at this church have the possibility to transform their community through what they do and I am super excited to see what God does!